SEOUL, Aug. 13, 2015 — Reflecting the growing demand and popularity of high quality music, LG Electronics (LG) will offer a high-fidelity (Hi-Fi) music service for customers of its premium smartphones. Starting this month, the new music service will be introduced via LG SmartWorld app on certain LG phones and at www.lgworld.com in nearly 70 countries including the United States, Australia, Brazil, China, France, Italy, Russia and the United Kingdom. Hi-Fi music delivers audio quality very close to the original sound with playback of 24bit/192kHz, about six times richer and clearer than the sound quality of a typical CD (16bit/44.1kHz). Qualifying customers will be able to download two free Hi-Fi tracks each month with the option to purchase songs at up to 50 percent off the regular price. 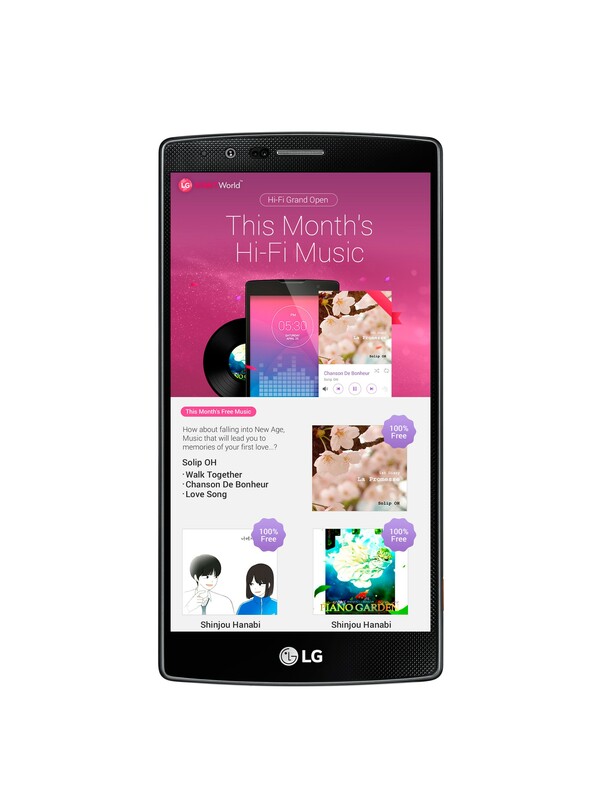 Customers can easily enjoy Hi-Fi music on the road with an LG smartphone with 24bit music playback capability, including the G4, G3, G2 and G Flex 2.